I know many of you love to scrapbook and have a lot of experiencing doing this. I struggle to get photos in an album let alone scrapbook with them! In the past I have dabbled with a few scrapbook layouts to create newborn baby gifts. The project I undertook a couple of weeks ago was much more involved and I put a lot of my heart into it because it was around my daughter. This photo was taken at her cousin’s wedding in Tasmania earlier this year and I just love her simple, natural look here. I used several products on this layout including the Blended Seasons bundle and products from the Tea Room Suite. The Petal Promenade Designer Series Paper worked in so well with the colours of Cassidy’s dress. I tore the edge and dabbed it with Soft Suede ink to give it a distressed look. Behind the photo I’ve added added a die cut from the Stitched All Around dies. Several flowers were stamped and coloured in Calypso Coral, Petal Pink, Old Olive and Granny Apple Green Stampin’ Blends. These are quite quick to fussy cut. I then die cut leaves from the Blended Seasons dies, cut them apart and arranged around the flowers. The Olive green panels are from the Tea Room Memories and More Card Pack and I’ve also added some Wood Twxture DSP which has been matted onto Soft Suede cardstock. I really love the sentiment as it expressed exactly what Cassidy is – a blessing in my life. It’s from the Very Vintage Hostess set and has been embellished with a Copper Vinyl sticker which is also from the Tea Room Suite. 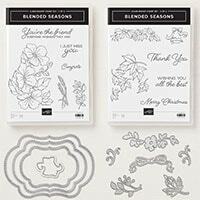 The Blended Seasons bundle is only available until 31st August. It’s a set that covers all seasons and you will get a lot of use out of it. I know I have been creating a lot with it. If you love it now is the time to get it before this promotion runs out plus every $90 spent in August earns you a $9 Bonus Days coupon. This can be spent in September so you get extra value with your purchase. Please contact me with any questions or feedback.